Little is known about how the coral host and its endosymbiont interactions change when they are exposed to a sudden nonlinear environmental transformation, yet this is crucial to coral survival in extreme events. Here, we present a study that investigates the transcriptomic response of corals and their endosymbionts to an abrupt change in pH (pH 7.60 and 8.35). The transcriptome indicates that the endosymbiont demonstrates a synchronized downregulation in carbon acquisition and fixation processes and may result in photosynthetic dysfunction in endosymbiotic Symbiodinium, suggesting that the mutualistic continuum of coral–algae interactions is compromised in response to high-CO2 exposure. Transcriptomic data also shows that corals are still capable of calcifying in response to the low pH but could experience a series of negative effects on their energy dynamics, which including protein damage, DNA repair, ion transport, cellular apoptosis, calcification acclimation and maintenance of intracellular pH homeostasis and stress tolerance to pH swing. This suggests enhanced energy costs for coral metabolic adaptation. This study provides a deeper understanding of the biological basis related to the symbiotic corals in response to extreme future climate change and environmental variability. Geologically abrupt carbon perturbations such as the Palaeocene–Eocene Thermal Maximum (PETM, approx. 56 Ma) are the closest geological points of comparison to current anthropogenic carbon emissions. 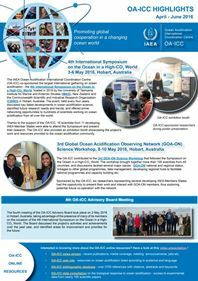 Associated with the rapid carbon release during this event are profound environmental changes in the oceans including warming, deoxygenation and acidification. To evaluate the global extent of surface ocean acidification during the PETM, we present a compilation of new and published surface ocean carbonate chemistry and pH reconstructions from various palaeoceanographic settings. We use boron to calcium ratios (B/Ca) and boron isotopes (δ11B) in surface- and thermocline-dwelling planktonic foraminifera to reconstruct ocean carbonate chemistry and pH. Our records exhibit a B/Ca reduction of 30–40% and a δ11B decline of 1.0–1.2‰ coeval with the carbon isotope excursion. The tight coupling between boron proxies and carbon isotope records is consistent with the interpretation that oceanic absorption of the carbon released at the onset of the PETM resulted in widespread surface ocean acidification. The remarkable similarity among records from different ocean regions suggests that the degree of ocean carbonate change was globally near uniform. We attribute the global extent of surface ocean acidification to elevated atmospheric carbon dioxide levels during the main phase of the PETM. • First observations of Cibicidoides pachyderma var. C. mundulus under in situ pressure and temperature. • Option for an epi- or endobenthic habitat is pH-dependent. • Under normal pH exhibits strong rheotaxis. • Growth in Cibicidoides pachyderma var. C. mundulus requires a protective sedimentary cyst. Most palaeo-deep-water reconstructions are based on geochemical information stored in the calcareous shells of Cibicidoides species but hardly anything is known about their life cycle, population dynamics or ecology. The number of specimens of a single Cibicidoides species can locally be very limited and species may be lacking completely during certain intervals in the geological past. As a consequence, geochemical analyses are often carried out on lumped Cibicidoides spp. assuming that they share the same epizoic to epifaunal habitat and precipitated their shell in comparable offsets to surrounding bottom water mass properties. However, there is a growing body of evidence that particularly Cibicidoides pachyderma and its morphotypes C. mundulus and C. kullenbergi, may not be reliable bottom water recorders. We have recently developed aquaria that allowed, for the first time, observations of Cibicidoides pachyderma var. C. mundulus under in situ pressure and temperature. Experiments were carried out with and without artificial sediments to simulate soft sediments and rocks, respectively. Seawater was set to pH 8 and pH 7.4 to simulate more or less particulate carbon export or more or less ventilation of bottom water. Our experiments demonstrate that C. mundulus may opt for an epifaunal or an infaunal habitat depending on elapsed time following physical disturbance, pH, current activity, the availability of sediments and growth. The specimen’s initial response following transfer from atmospheric pressure into the high-pressure aquaria was to immerse into the sediment or to cover more or less parts of the test with aggregated sediments or algae. However, within 24 h a strong rheotaxis became apparent and most specimens moved to sites of increased current activity under normal pH conditions (pH 8). Only few specimens remained in algae cysts or in the sediment in the pH-8 experiment. On the contrary, all specimens under pH 7.4 agglutinated a firm sediment cyst around their test and remained infaunal throughout the experimental period of three months. Independent of pH, growth was only observed in specimens that lived within an agglutinated cyst or infaunal. A solid thick cyst covered the specimens of the pH 7.4 experiment throughout the experiment and possibly restricted water exchange between the in-cyst water and the surrounding artificial bottom water mass. We suggest that a more fragile and possibly more porous sedimentary envelope may, at least temporally, have covered the infaunal specimens under pH 8 but no evidence for this was found upon termination of the experiment. 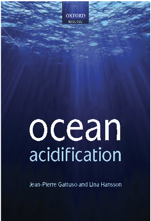 Increasing atmospheric carbon dioxide and its dissolution in seawater have reduced ocean pH and carbonate ion concentration with potential implications to calcifying organisms. To assess the response of Caribbean benthic foraminifera to low carbonate saturation conditions, we analyzed benthic foraminifera abundance and relative distribution in proximity to low carbonate saturation submarine springs and at adjacent control sites. Our results show that the total abundance of benthic foraminifera is significantly lower at the low pH low calcite saturation submarine springs than at control sites, despite higher concentrations of inorganic carbon at the spring sites. The relative abundance of symbiont-bearing foraminifera and agglutinated foraminifera was higher at the low pH low calcite saturation submarine springs compared to control sites. These differences indicate that non-symbiont bearing heterotrophic calcareous foraminifera are more sensitive to the effects of ocean acidification than non-calcifying and symbiont bearing foraminifera, suggesting that future ocean acidification may impact natural benthic foraminifera populations. Acidification and land-based sources of pollution have been linked to widespread declines of coral cover in coastal reef ecosystems. In this study, two coral species, Acropora cervicornis and Pocillopora damicornis were exposed to increased copper at two CO2 levels for 96 h. Copper accumulation and anti-oxidant enzyme activities were measured. Copper accumulation only increased in A. cervicornis zooxanthellae and corresponded with photosynthetic toxicity. Enzyme activities in both coral species were affected; however, A. cervicornis was more sensitive than P. damicornis, and zooxanthellae were more affected than animal fractions of holobionts. Generally, activities of all anti-oxidant enzymes increased, with copper exposure in corals; whereas, activities of glutathione reductase and to some degree glutathione peroxidase were observed due to increasing CO2 exposure alone. Exposure to copper in combination with higher CO2 resulted in a synergistic response in some cases. These results provide insight into mechanisms of copper and CO2 impacts in corals.